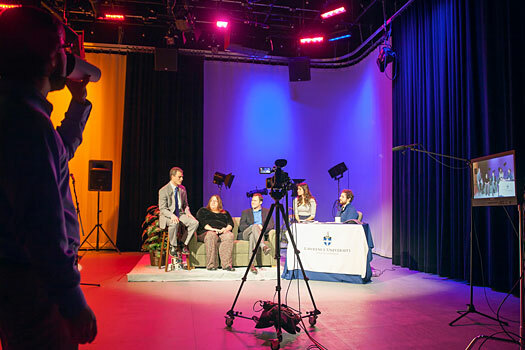 For everyone who has ever wondered what Lawrence University is all about, a LIVE, 10-hour webcast Wednesday, Oct. 11 will provide an insider’s look at some of the people and programs that make the university an interesting and vibrant place. Lawrence’s fourth annual Giving Day event, which will be webcast live at go.lawrence.edu/givingday from 11 a.m. to 9 p.m., features interviews with faculty, administrators, accomplished alumni and students, including some who currently are studying abroad. There also will be nearly a dozen live musical performances, hands-on demonstrations and maybe a surprise guest appearance or two. Kasey Corrado, Lawrence’s social media director, will be back in the hostess chair for the fourth year in a row. She’ll be joined by Ken Anselment, dean of admissions and financial aid, who returns for his second stint as co-host. Anselment, whose lone battle scar from his initial Giving Day hosting duties — a scratchy throat from over talking — admitted that will serve as a helpful reminder to keep the focus on the guests. It’s the surprises that come with hours of planned, yet improvised, programming, where some of the best moments happen, said Anselment. 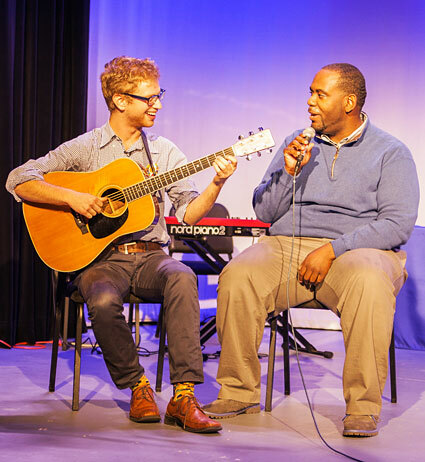 Musical performances are always a staple of Lawrence’s Giving Day webcast. • Gary Vaughan, discussing Lawrence’s innovation and entrepreneurship program, including a presentation from a member of last spring’s winning team at The Pitch Competition. • Amy Ongiri from the film studies program, with staff videographer Chris Gore-Gammon, who will give a virtual reality demonstration. • Biologist Israel Del Toro discussing the Pollinator Project. • Performances by the Faculty Brass, Cantala women’s choir, an ensemble of 19 cellists, and others. • The student bands Sol Studios and The Embers as well as singer Bernard Lilly, a student from the Academy of Music and the student duet Jerry Wang and Eva Tourangeau. Garrett Katerzynske, Lawrence’s director of video production, not only juggled most of the proverbial chain saws in lining up the guests for this year’s production, he also steps into the director’s chair for the first time. In scouring the campus the past several months for guests, Katerzynske said he uncovered some incredible stories and witnessed many remarkable performances. 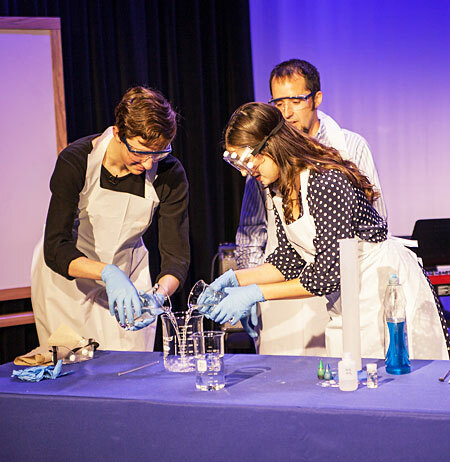 Hands-on demonstrations always add an element of the unknown to the Giving Day webcast. Lawrence held its first Giving Day in 2014 as a one-day-only fundraising event for alumni and friends to show their support for Lawrence, its programs and students. Since that first event, Giving Day has generated more than $3.7 million from more than 6,400 students, alumni, parents, faculty, staff, and friends of the university. Many of the guests appearing on the webcast are grateful beneficiaries of the generosity of Giving Day donors and serve as examples of the way funding assists faculty, students and programs on campus. As in previous years, Lawrence Giving Day 2017 has been made possible by a generous group of alumni, parents and friends who have committed to be “Game Changers,” providing matching funds as motivation for others to support the college. “Giving Day’s goal isn’t just to raise money, although that is an important aspect,” said Kayla Schumacher, Lawrence’s director of annual giving. “This is a chance for everyone in the Lawrence community to come together for 24 hours and celebrate the things they care about here.